For those of you who don’t already know (in which case you’ve clearly been living under a rock), Slack is the most popular team messaging tool of the century. And it is AWESOME! 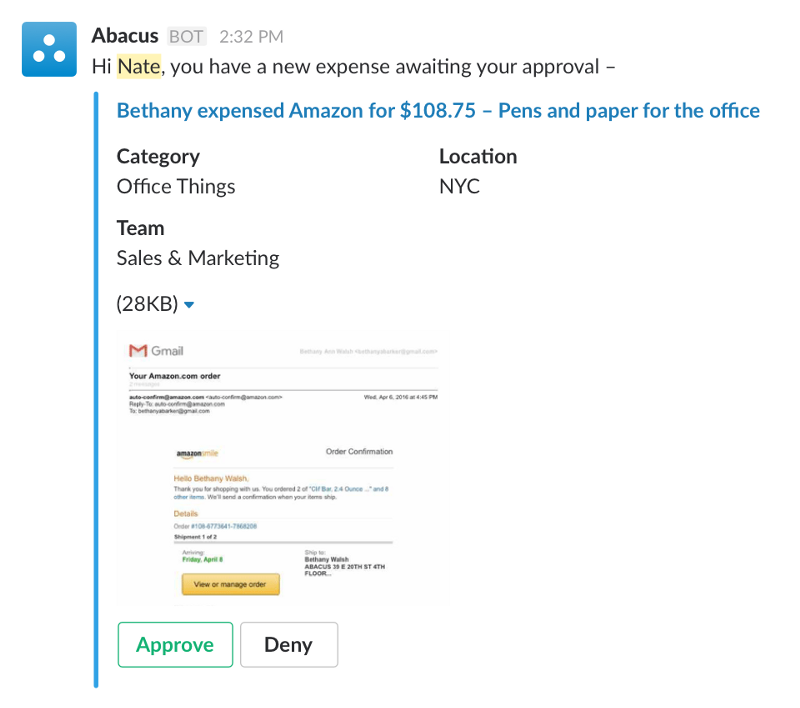 Slack is now on a mission to make it even easier for us to get things done at work, supported by the launch of Message Buttons — interactive elements that enable better interactions with some of the 500 apps in Slack’s marketplace. Early launch partners include Trello, Kayak, and Riffsy. The idea behind message buttons is to streamline the work done on other daily tools. By having a Slack button, you can trigger an action within the app with a single click. So you might be able to approve and submit invoices or expense reports, create cards and details in a Trello board without leaving Slack; or search for flights, hotels, and rental cars with a single tap. Move projects in Trello forward by assigning due dates, categorizing tasks, and linking conversations from a Slack channel to a Trello card. With Abacus, employees can upload receipts and submit expenses that their managers can then review and approve. Slack already has over 500 apps available on its app store. And they can be configured to work specifically with how an organization uses and relies on Slack to get work done. Making those apps interactive in new ways only makes the service several times more attractive than it already is, and considering their 3 million daily users, that’s really saying something. “We don’t have an opinion about keeping people in Slack, but it’s really about bringing all the tools together in a command center for teams,” says Buster Benson, a senior product manager at Slack. It is undeniable that Slack is slowly, but surely, turning into what some are now calling “the operating system of the workplace”.